Just like O Little Town of Bethlehem, the carol Silent Night is so enmeshed with our photoshopped ideas of the birth story, it’s easy to view Christmas as a seasonal and romantic escape from the harsher business of life. An honest reading of the story, though, makes escape impossible. Though recorded in a different age, Simon and Garfunkel’s ‘Silent Night and the 7 o’clock news’, the final track on their 1966 album Parley, Sage, Rosemary and Thyme, makes a more timeless point. In our Advent reflections at Collins Street, we’re listening to the ‘songs’ of those gathered up in Luke’s story of Jesus’ birth. In the first week it was Mary’s song (1.46-55) and this last Sunday Zechariah’s (1.68-79). I wondered out loud just how much Zechariah understood the truth of his words. As sincere as his declaration was and as passionate his performance, did he really comprehend the extraordinary breadth of God’s purposes in the births of his son John and of Jesus? My suspicion is that Zechariah was as culturally blinkered as we all are. A devout Jew–deeply formed within a particular culture, story and tradition–Zechariah’s perspective on God, the world, and the nature of peace was limited, even prejudiced by his own context and humanity. ‘O little town of Bethlehem how still we see thee lie. Above your deep and dreamless sleep the silent stars go by. I confess that when I sing such a song, as sincere as my faith is, I do so with limited understanding. People like me–those for whom Bethlehem is really nothing more than a romanticised venue of still and starry nights–sing with such ignorance of Bethlehem’s reality. This past Friday afternoon, I stood in Melbourne’s city square by a nativity scene set up for Christmas. On one side of this cut-out stable stood a large crowd of pro-Palestinian demonstrators with their placards and flags, and on the other side a small group of mostly elderly supporters of Israel with their banners and leaflets. The tension was thick. Amidst the chanting, the accusations and the slogans, I felt deeply sad as I looked on: sad about the passion and pain on both sides of the divide and more acutely aware of my own distant ignorance. In 2011, three young men came together in Bethlehem to understand better what peace really means in a place of such conflict. They were men of three different faiths, one a Palestinian resident of Bethlehem, one a former Israeli soldier, and the other a Christian Palestinian refugee in Spain returned to his homeland. In a documentary called Little Town of Bethlehem the stories of these young men are told as they struggle to understand and to work together for genuine peace. As part of the film, an adapted version of the Bethlehem carol is sung in Arabic. We listened to it this past Sunday. While most us us could not understand the words, we could help but feel the song. We had our very own poet-in-residence at Collins Street this year, Cameron Semmens. Cameron was wonderful and demonstrated beautifully both the playfulness and power of words. Today’s Advent song is based on the words of one of the Church’s earliest poets, a Roman by the name of Aurelius Prudentius Clemens. I reckon with a last name like that Cameron and he could be related. Aurelius was born in Northern Spain in 348. He practiced law with great success and even served time as a provincial governor, but he longed for a more contemplative way of life. He finally found it in retirement. He wrote his poetry in Latin. Here’s one version of it, with the words to all nine stanzas following. Hail! of all the living King! ‘O Holy Night’ (Cantique de Noël) has to be one of the most beautiful songs of the season. It’s from the poem ‘Minuit, chrétiens’ (Midnight, Christians) written by the Frenchman Placide Cappeau (1808-1877). Cappeau was the son of a wine merchant who would eventually take up the family business, but his first love was forever poetry. Well educated in art, law and literature, Cappeau was asked by his parish priest to write a poem for Christmas. It was risky request. Cappeau was a staunch socialist, a republican and strongly anti-clerical in his religion. He wrote the poem on a stagecoach to Paris. Cappeau’s words were put to music in 1847 by Adolphe Adam and then a few years later the Unitarian minister John Sullivan Dwight adapted the poem into the English version we sing today. Yesterday, the first Sunday of Advent, we began the season at Collins Street with that wonderful carol, O Come let us adore him. In the morning we sang it to each other as our call to worship and in the evening as we gathered around the communion table. This one’s for you, Stefanie. Another take on the story of Mary comes from an old folk carol ‘Gabriel’s Message’. Apparently it originated in Basque, the ancestral language of a deeply religious people spread across northern Spain and southern France. It’s English version didn’t arrive until the late 19th century. most highly favored lady,’ Gloria! ‘Most highly favored lady,’ Gloria! What’s fun to me is that two of our deacons at Collins Street, Roz Otzen from the morning congregation and Nigel Smith from 5pm, both name it at the top of their Advent song list. Let’s just say there’s a slight generational difference! So here’s two versions of the same song, one with the choir of Kings College in Cambridge. And the other with Sting. Take your pick! Tekeste is originally from the Horn of Africa. We work together at Collins Street. When I asked him what music touches him at Christmas time, his response was almost immediate. He told me about Alemu Aga, an Ethiopian who composes indigenous music for the church in Ethiopia and Tekeste’s homeland of Eritrea. Alemu plays a stringed instrument called a beghena and sings in Amharic. The extract below is taken from a much longer piece of music that tells the Mary story in a very different way. It’s one Tekeste loves to hear at this time of year. In this segment Mariam, as she is known in Amharic, is visited by the angel Gabriel with the life-changing news that she is to bear a child, a holy child sent by God. I’ve been gone a while. Away on writing leave … an introvert’s heaven! The first week away was like gulping at handfuls of cold water, most of it running straight through my fingers. The more I drank the more I understood how thirsty I was. I’m glad to say, too, that I made some good progress on ‘the book’. Perhaps 2013 will be the year. Now I’m back on deck, Advent looms. It’s a great time of year. At Collins Street we’re drawing on what we’ve called the Songs of Advent, the hymns of confession and adoration offered by the witnesses to Jesus’ birth in Luke’s gospel. 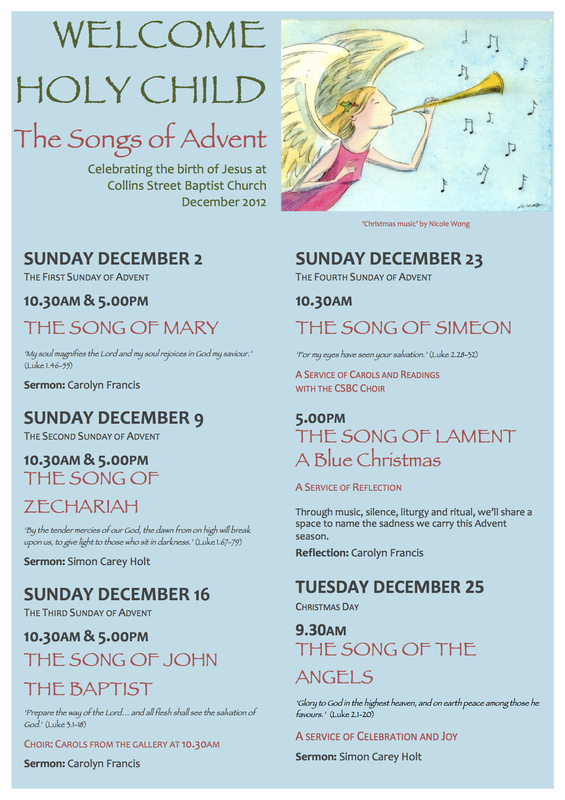 This Sunday we begin with Mary’s song, otherwise known as the ‘magnificat’ in Luke 1.46-55. To stay with the theme, we’re also sharing together some of the songs of the season that are significant to us. Music is a powerful thing and its connection to this time of the year can run deep. It certainly does for me. So I get to go first. A song that really does it for me is one I only discovered a few years back. As it happens, it blends beautifully with this week’s gospel. To be honest, I’ve never known what to do with Mary. She’s an enigma to me. And when I listen to the most popular retellings of the birth story I’m none the wiser. She is either deified beyond all recognition or left to play a bit part in a drama that leaves her essentially silent. It’s why Patty Griffin’s ‘Mary’ was a revelation when I first heard it. In a very simple way Griffin paints a compelling picture of the relationship between Jesus and his mother, one that began in a manger but grew far beyond it. What the song hints at is the unique role a mother plays in a child’s life, no matter who that child is or becomes. He flies right by and leaves a kiss upon her face. The song provides a glimpse of Mary neither deified nor marginalised. Her role in Jesus’ life didn’t stop in the manger and neither was her mother’s love defined by it. Ever in the background, her finger prints are on every page of Jesus’ story. Deification is completely unnecessary. Her story is sacred enough.